As she comes to her final year in office, Governor Mary Fallin is setting a "legacy" of pushing for the largest tax hikes in Oklahoma history. In an ironic twist, she is simultaneously supporting the largest federal tax cut in decades. Back in February, Fallin proposed a massive expansion of the state sales tax, amounting to over $1,703,879,742.00 ($1.7 Billion). Additional taxes she proposed brought the total to nearly $2.6 Billion. I've posted extensively on the Fallin Tax Hikes, which have shifted and morphed over the past ten months. The state legislature went along with her on some of her ideas, while discarding many of the worst parts of her proposed tax hike packages. While Governor Fallin was doing her best to increase taxes on Oklahomans, our seven Republican members of Congress were working to pass a package at the federal level that would dramatically cut taxes. Today, the U.S. House voted on final passage of the Tax Cuts And Jobs Act, with the U.S. Senate expected to pass it later tonight and send it to President Donald Trump's desk for his signature. 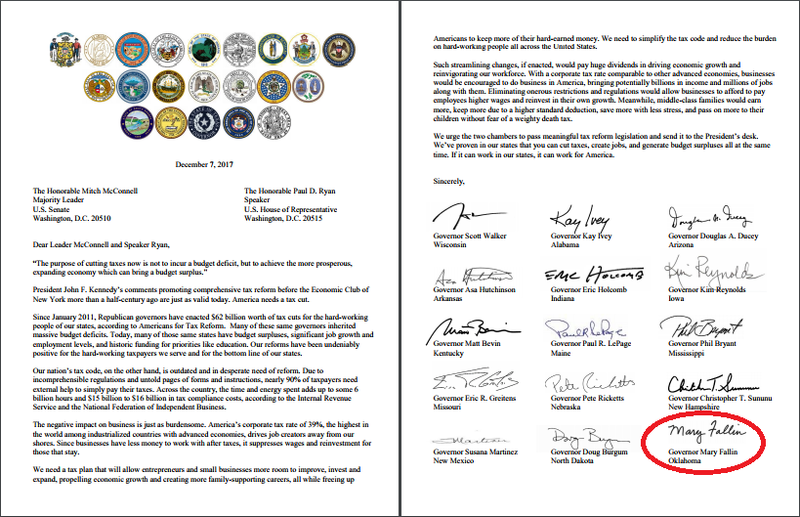 To help with that effort, Wisconsin Governor Scott Walker organized a letter of support, sent to Senate Majority Leader Mitch McConnell and House Speaker Paul Ryan, and signed by 21 Republican governors. In further comments on the letter, posted on WhiteHouse.gov, Governor Fallin said, "Our nation’s tax code, on the other hand, is outdated and in desperate need of reform. Due to incomprehensible regulations and untold pages of forms and instructions, nearly 90% of taxpayers need external help to simply pay their taxes." In the Governors' letter, Fallin put her stamp of approval on this statement, and others: "We need to simplify the tax code and reduce the burden on hard-working people all across the United States." 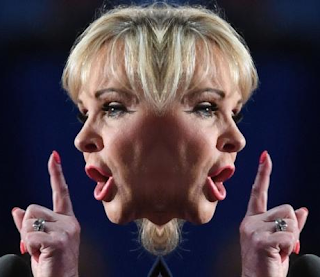 Which is it, Governor Fallin? Do you want to reduce the tax burden on hard-working Oklahomans or do you want to increase the tax burden on hard-working Oklahomans? You can't have it both ways. To quote James 1:8, "A double minded man [or woman, in this case] is unstable in all his ways."